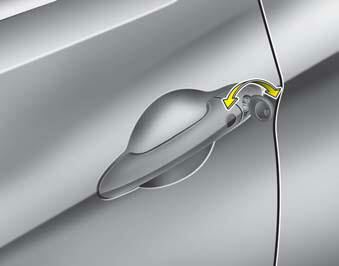 • Turn the key toward the rear of the vehicle to unlock and toward the front of the vehicle to lock. • If you lock the door with a key, all vehicle doors will lock automatically. • From the driver’s door, turn the key toward the rear of the vehicle once to unlock the driver’s door and once more within 4 seconds to unlock all doors. 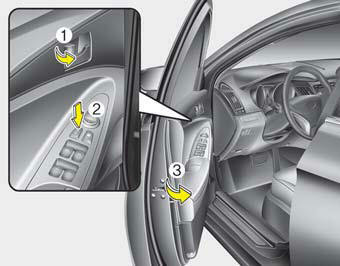 • Doors can also be locked and unlocked with the transmitter (or smart key). • Once the doors are unlocked, they may be opened by pulling the door handle. • When closing the door, push the door by hand. Make sure that doors are closed securely. • To lock a door without the key, push the inside door lock button (1) or central door lock switch (2) to the “Lock” position and close the door (3). Always remove the ignition key, engage the parking brake, close all windows and lock all doors when leaving your vehicle unattended.• If you lock the door with the central door lock switch (2), all vehicle doors will lock automatically.